The second small-scale liquefied natural gas (LNG) carrier owned by Scandinavia's gas supplier Skangass should arrive in the Lithuanian port of Klaipeda over the weekend, gas trade company Litgas confirmed to LETA/ BNS. "The gas carrier should arrive on Sunday evening," the company's representative Paulius Jakutavicius said but refused to specify the amount of gas to be loaded onto the vessel and the ports Skangass would deliver the gas to. The first carrier of this type was filled in Klaipeda in early January. 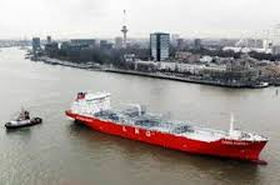 It was reportedly loaded with about 15,000 cubic meters of LNG, which, according to Litgas' calculations, will yield about 130,000 euros in revenue to the terminal and the port. Under the three-way agreement, Norway's Statoil sells LNG to small-scale supply buyers and Litgas and Lietuvos Duju Tiekimas provide modulation and balancing services. This was stipulated in the long-term 2014 agreement with Statoil as an additional benefit for Lithuania.